Do feuds ever really end? Is history ever really in the past? 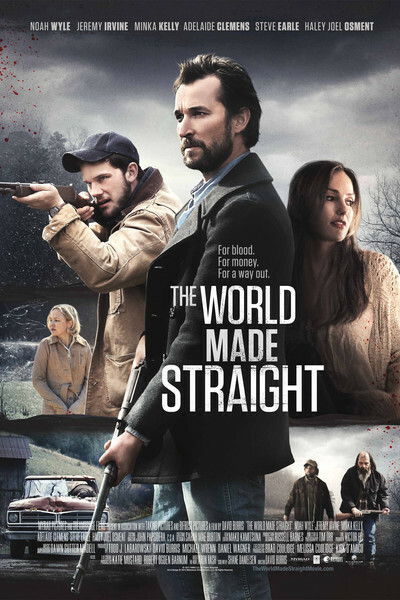 "The World Made Straight" asks these and other big questions as it adapts Ron Rash's novel, telling the story of a 17-year old North Carolinian who gets tangled up with drug dealers in the mountains sometime in the 1970s, diving deep into film noir/pulp territory while occasionally flashing back to Civil War-era brutality. The movie never entirely rises to the height of its ambitions, though: there are moments when you can practically hear it straining to impart significance to what is, in the end, a fairly standard sensitive-young-criminal-in-over-his-head story, and the final stretch seems torn between wanting to resolve everything with violence and telling us violence never solves anything. You certainly couldn't accuse the novel's adapter, Shane Danielsen or its director David Burris of aiming too low. If you succumb to the film's very deliberate rhythms, there's much to admire here, including the desaturated widescreen photography (by Tim Orr, who has shot many films by David Gordon Green), which seems at least partly inspired by the silvery Civil War photographs of Mathew Brady; the acting, by an admirably focused cast that includes a bearded and deep-voiced Noah Wyle ("E.R.") and singer-songwriter Steve Earle; and Earle's score of bluegrass-flavored instrumental cues and quiet yet menacing songs, which enfolds and subsumes the film in the manner of Leonard Cohen's bard-like contributions to "McCabe and Mrs. Miller." Jeremy Irvine of "War Horse" stars as Travis, a high school dropout with a good heart but a tendency to take moral shortcuts that set him ever farther back in life. The story begins with Travis getting fired from his grocery store job for giving food to a homeless man; soon he falls in with a pot dealer named Leonard (Wyle), who lives in a trailer with his drop-dead-gorgeous blonde girlfriend, Dena (Minka Kelly), a drug addict and unnervingly blatant flirt. Their association begins when Travis cuts a marijuana plant from the property of Carlton (Earle), Leonard's main rival in the region, and sells it to Leonard. Here, as elsewhere, the film goes the extra country mile to invest standard crime movie types with rich, eccentric life: Leonard is a former high school teacher who lost his wife, daughter and job in an incident tactically withheld till later in the story, and though he has a honeyed bourbon drawl and a beer-drinker's gut-first walk, there's something intriguingly private and sensitive about him. He keeps Civil War literature in a bookcase above his bathroom toilet, hunts for Civil War relics with a metal detector, and listens to Aaron Copland records, which he somewhat peevishly defends against the complaints of Travis' dull-witted buddy (Haley Joel Osment), who thinks it's terrible and boring. Leonard warns Travis that it's not a good idea to steal pot from feared criminals, but the kid won't listen, and during a return trip to Carlton's property, he gets his foot stuck in a bear trap, passes out, and finds himself in Carlton's house, with the bearded, bearish crime boss looming over him. Earle is a revelation here: he's given decent performances elsewhere, notably in David Simon's HBO series "The Wire" and "Treme," but this is a full-bodied character turn filled with right-on choices, including the measured, vaguely philosophical way that Carlton delivers threats, as if he's always speaking hypothetically even when describing exactly what he's going to do to someone. After a brief stay in a clinic where Travis is tended by a kind nurse and future love interest named Lori (Adelaide Clemens of the Sundance series "Rectify"), he returns home to his family only to get kicked out, and holes up with Leonard, who takes a somewhat fatherly interest in the young man's fortunes and encourages him to study for his GED. In all, however, the metaphorical and historical weight that the film places on the story's shoulders sits rather awkwardly, and the characters just can't bear the weight, even with Earle's plaintive and heroically un-ironic songs ringing out on the soundtrack. Like "Out of the Furnace," a present-day crime drama with similar elements that's set in similar terrain (though much farther north), "The World Made Straight" never figures out how to smoothly integrate its straightforward melodrama and literary pretensions. The music and photography sure are magnificent, though: every frame a painting, every scene a song.